Masonite is a brand of hardboard siding made from compressed wood fibers. Like all wood siding products, Masonite requires regular painting to maintain its appearance. Because hardboard siding tends to absorb water fairly easily, it's important to choose the right paint and techniques for the job to ensure your results will last. Proper preparation and removal of existing paint is also vital to a successful paint job. Spread drop cloths or plastic sheeting over bushes and grass to protect these areas while you work. These sheets also help collect paint chips and dust to make cleanup easier. Protect your eyes with safety glasses and wear a dust mask while you work. Use a paint scraper to carefully scrape away all existing paint. Work gently to avoid damage to the Masonite. Use a ladder to reach higher sections of siding, but use caution to avoid falls. Sand the Masonite once all paint has been removed. Use a hand-held disc or random orbital sander equipped with very fine sanding pads. Keep the sander moving the entire time to avoid gouges or scratches. Clean all sanding dust and paint chips using a vacuum. Apply an exterior alkyd primer to the siding using a paint roller. Pay particular attention to the edges and bottom of each board, as these areas tend to absorb water. Use a brush to reach small areas. Allow the primer to dry completely before applying your first coat of paint. Alkyd primers and paint tend to have a fairly long dry time, so check the paint can to get a general time frame. Apply a coat of acrylic latex paint over the primer. Use a clean roller to paint large areas, and a small brush to reach into tight spaces. Wait for the first coat to dry completely, then apply a second coat of paint using the same techniques. If you're house is very large, consider applying paint and primer with a paint sprayer. For best results with Masonite, go over the paint with a roller to ensure it is spread across the entire surface once spraying is complete. This technique is known as "back-rolling," and is helpful for filling in uneven areas or roughly-textured surfaces. If your house was built before 1978, beware of lead paint. Buy a lead paint testing kit to check your paint. If it is lead-based, wear a respirator while you work and vacuum all dust and paint chips with a HEPA (high-efficiency particulate absorbing) vacuum once the job is complete. 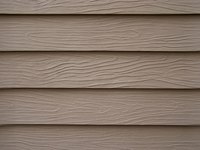 What is Masonite Hardboard Siding?